Mr. Popli, the mouse mayor of Garbage Island, is always at odds with Archibald Shrew, a brilliant but reckless inventor. When Garbage Island, their home in the Great Pacific Garbage Patch, splits apart, they are trapped together in Mr. Popli's houseboat, desperate to find their way back home. At first, they only argue, but when they face a perilous thunderstorm and a series of predators, they begin to work together and recognize - in themselves and in each other - strengths they didn't know they had. As I read through the various blog posts written by other blogger about Garbage Island, I decided to take a slightly different direction. First, Koehler’s first middle grade novel is well done. The book is filled with a wonderful cast of characters, an unique setting, and an adventure full of action that will have readers turning the pages and fully engaged in the outcome. As I started the book, I had the same feelings of reader happiness as I had when I started the REDWALL series by Brian Jacques years ago. As I continued to read, and given that I knew the book was influenced by the concern of trash in the ocean, I couldn’t help but wonder if students would see the story differently if they understood something about the real issues facing marine life and birds and other creatures. Yes, yes, I think reading should be for fun and Garbage Island is an enjoyable read on it’s own. However, I also, am not opposed to sharing other books and encouraging student to read and make their own connections. As regular readers of my blog know, I am a big fan of nonfiction. The spark of an idea for this book grew out of a very real problem. 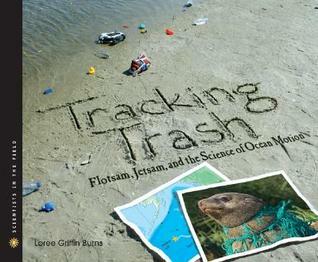 Koehler references “a vortext of floating trash swirls in the Pacific Ocean” in his author’s note. I would love to see students explore the issue of trash in our oceans and there are a number of amazing nonfiction titles to spur on young readers. Don’t miss the Ocean Cleanup Website as well. Look for Garbage Island at your local indie bookstore or check out a copy at your community library. Giveaway: I am giving away one copy of Garbage Island to a lucky reader. Participants must be 13 years old or older and have a U.S. mailing address. Please complete the rafflecopter below to enter.